The coastal hub of Shanghai is a wild place to visit. China’s biggest city is as famous for its lively traditional restaurants as it is for its colonial architecture. 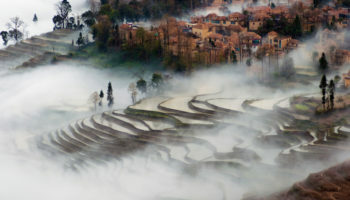 A visit here is a fascinating look both into recent history and definitively modern-day China. In the mid 19th century, parts of Shanghai became ‘Concessions’ of various international governments, including France, Britain, and America. 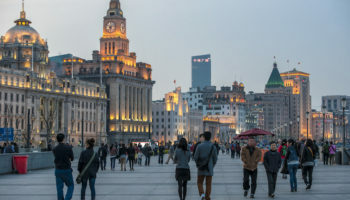 The Bund, with its grand European buildings, was once part of this grouping and is one of the most famous areas of the city, whilst the Old French Concession is a haunt of thirsty expats and tourists alike. But the city remains firmly Chinese. The most modern part of the city, Pudong, reflects the boom in China’s prospects in the late 20th century, with skyscrapers like the famous Shanghai Tower and the Oriental Pearl Tower providing vistas of the urban sprawl. There’s even a Disneyland here now. And where there’s a big city, there are 5-star hotels. The city has no shortage of them, but staying in Shanghai is also very doable. 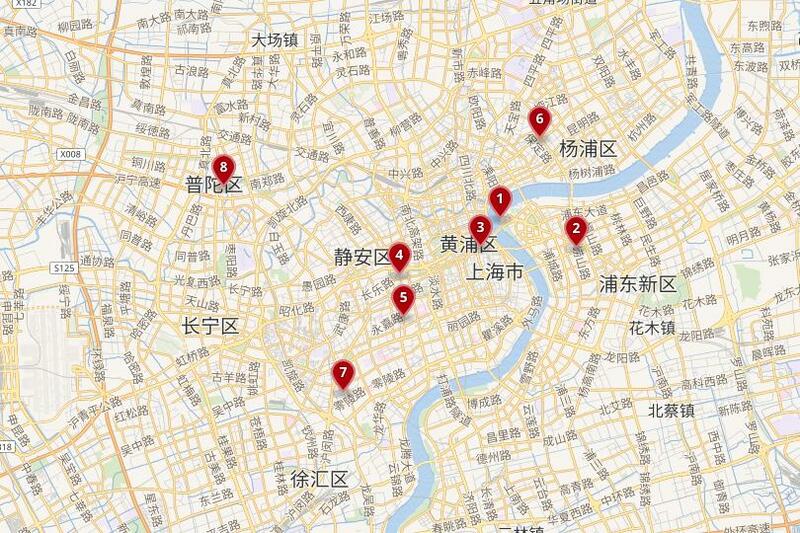 Want to get around and see all the neighbourhoods Shanghai has to offer? Easy — just navigate the sprawling metro and the city is yours. Once home to historically significant shikumen neighborhoods, the Bund has undergone major development over the past ten years to emerge a flashy district full of chic dining and polished heritage hotels. Located on the Huangpu River’s west bank, this is the place to come for sparkling views across the river of Shanghai’s immense, futuristic skyscrapers in Pudong. The Bund actually dates back to 1843, when it was the British Concession, and boasts historic colonial buildings as a result; many of these were once European banks and economic headquarters that became the founding point of modern-day Shanghai. The Bund’s central position means speedy transport links across the city. You have the choice of staying in iconic hotels such as the Waldorf Astoria (set in an old gentlemen’s club), or the extravagant Art Deco Fairmont Peace Hotel. Stuffed full of upscale luxury, The Bund is the place for high-end shopping and a nightlife to match. Les Suites Orient – With its chic interiors and high-end facilities, this hotels offers up a world of comfort and style. Rooms here feature parquet floors, art deco furnishings, large beds and incredible views of the Huangpu River. The suites on offer even boast large lounge and dining areas. Guests have the choice of dining at two restaurants serving a mix of Western and Asian cuisine. Located just a five-minute stroll from the Yuyuan Garden, the hotel is also within easy reach of public transport: a Metro station is nearby and the Shanghai Ferries pier is just in front of the hotel. Riverview Hotel on the Bund – Housed inside a grand building, rooms at this hotel are large with touches of golden detailing, plush furnishings and large comfortable beds, all accented with subtle lighting. The hotel is adorned with chandeliers and marble floors throughout. Staying here means guests can either enjoy dinner in the hotel’s riverside restaurant or relax with a drink in the lounge bar. There’s also a fitness center and games rooms to enjoy. From here, the metro and ferry terminal are both ten minutes on foot. 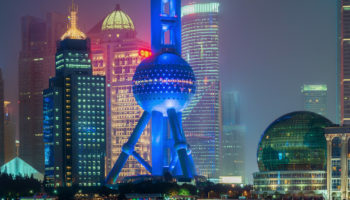 The district of Pudong — located across the Huangpu River from the historic town center — shares its name most obviously with Shanghai Pudong International Airport. This makes it a convenient place to stay for anyone looking to get to or from the airport. Pudong isn’t bursting with charm but it is tall. Featuring skyscrapers and tower blocks, you can get a good view of the city from the iconic Oriental Pearl Tower. 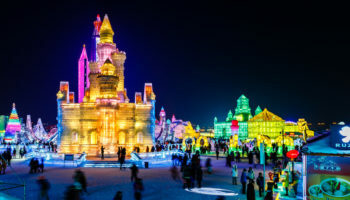 There are also large attractions, like the futuristic World Expo Centre, Century Park – complete with boating lake, mini golf, and cycling paths – as well as its biggest draw: Shanghai Disney Resort. These make it great for families on a trip to Shanghai. However, if you’re looking for nightlife, head to the Lujiazui district with its glitzy feel. Mid-range hotels are easy to come by, with a fair few high-end options and 5-star hotels to choose from. Grand Hyatt Shanghai – Actually located inside the Jin Mao Tower, the Hyatt Shanghai is strikingly designed with eye-catching design details throughout. Rooms here combine contemporary Shanghai style with traditional touches, boasting marble bathrooms, soft grey carpets and breathtaking city views from the large windows. After a busy day shopping at the nearby Super Brand Mall, you can return to the hotel for a swim in the rooftop pool. There’s a wide choice of dining options across the nine different restaurants, as well as a piano bar and a rooftop bar. IFC Residence – Set in the Shanghai International Finance Centre, this 5-star hotel offers rooms for both residents and guests. These are lavishly but tastefully decorated with subtle colour palettes and wide windows, complete with views across the city. Each has its own kitchen and lounge area. Facilities at the IFC Residence include an indoor pool, a fitness center, a garden, a children’s playground and a sun terrace. There’s a metro station connected to the same building for extra convenience, but from here you can also reach the Shanghai Aquarium on foot in 10 minutes. Novotel Atlantis – Located less than 10 minutes away from a metro station, and close to Custom House Shanghai, this branch of Novotel features rooms that are simple but modern, with white walls and neutral tones; city views naturally take centre stage. Each guest has access to a smartphone in the room, which is good for getting around. There’s also an on-site pool so you can swim with a city view. However the star of the show at this hotel is the rotating restaurant. Shanghai’s traditional city center, Huangpu is where you will find some of the most famous sites in the city. It’s close to the action and in easy reaching distance of great public transport links: Huangpu metro station is the largest in the city. 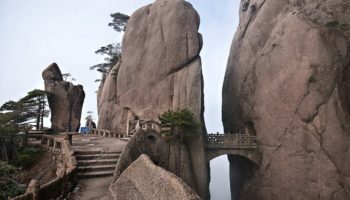 Stay in Huangpu if you’ve only got a couple of days and want to spend it seeing the city’s top attractions. You can visit the Shanghai Museum with its huge collection of ancient Chinese artifacts, or spend time in the future at MOCA, Shanghai’s first non-profit modern art gallery. Huangpu is also home to City Hall, as well as the cultural nucleus of People’s Square and People’s Park. Huangpu is also great if you enjoy a spot of retail therapy and cheap local food. Huaihai Road and the pedestrianized East Nanjing Road boast food stalls and top shopping. 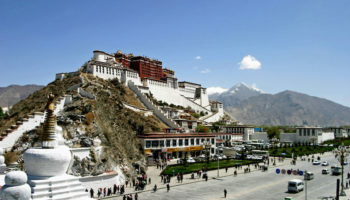 There’s a huge choice when it comes to hotels, food, and transport, but staying here also means you’ll be in one of the most densely populated urban districts in the world. Radisson Blu Hotel Shanghai New World – Rooms at the Radisson Blu are tastefully decorated with warm colours, and seating areas with traditional patterned carpets. Guests can have fun in the on-site games room or work up a sweat in the fitness center. But that’s not all. There are five different dining options inside the hotel too, some of which have panoramic skyline views. One of these restaurants sits atop a 208-meter tall tower. The hotel itself faces People’s Square, with the Shanghai Art Museum and Shanghai Grand Theatre practically on the doorstep. Grand Central Hotel Shanghai – Expect chandeliers and indoor palm trees at this grand, spacious hotel. It certainly feels like 5 stars. The Grand Central Hotel Shanghai is delectably decorated, with gleaming surfaces and sumptuous furnishings. The carpeted rooms here mix classical Chinese details with contemporary luxury and feature large, comfortable beds. Different dining options are to be had here, from buffets and coffee shops to traditional Cantonese cuisine. Central Hotel Shanghai – The Central Hotel Shanghai is all about its elegant modern interiors featuring dark wood, with rooms that feel light and bright thanks to their neutral colour palettes. You can opt for a massage thanks to in-house services, or while away some time in the sauna. Alternatively, have some fun in the games room with some billiards or indoor golf. You can also try out the delicious crab dishes at the on-site restaurant. True to its name, the location is central. It’s just east of Nanjing Road, and from here you can easily walk to Madame Tussaud’s and the Bund. Named after a Buddhist temple that calls this area home, Jing’an is awash with everyday attractions. From huge malls and amazing places to taste dim sum Shanghainese style on West Nanjing Road to the relatively tranquil Jing’an park, staying in this area means you’ll never be stuck for things to do. Also on West Nanjing is Jing’an Temple itself. 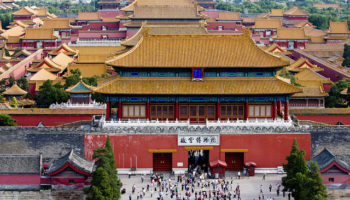 Visit to soak up some stunning architecture; dating back as far as the 3rd century AD, it was converted to a plastic factory under Mao before being reinstated as a temple in 1983. Staying at Jing’an is easy, thanks to a wide range of accommodation, from unfussy budget stays all the way to design-led luxury hotels. And you’ll have a whole lot of hip cafes and cool bars to frequent in the evening, which blur into the city’s old French Concession to the south. The Puli Hotel – Serving up a seriously sleek and modern hotel to stay in Shanghai, The Puli Hotel is definitely a place of sophistication. Charcoal grey, blacks and whites throughout give a monochrome sense of minimalist cool; this extends to the rooms which are simple and stylish, yet comfortable. There’s a fantastic, very well equipped health club on-site, as well as a spa which boasts its very own infinity pool. You’ll also find a restaurant and bar to enjoy here. Hotel Equatorial Shanghai – Just a few minutes from the Shanghai Exhibition Centre, the rooms at this hotel are spacious and smart with plush decor and city views. There is a choice of four restaurants, including a steakhouse, as well as a bar. Guests can unwind in the hot tub or keep up with their workouts in the fitness centre. There’s even a kids club and babysitting service for added convenience. The lobby is impressive and boasts marble floors, chandeliers and a glass dome. Campanile Natural History Museum Hotel – A simple 3-star offering in Shanghai, this option is actually pretty trendy and has been recently renovated. 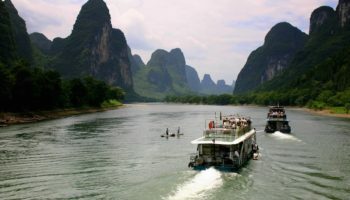 Best of all is its location, close to the Shanghai Natural History Museum, as the name suggests. Views from this hotel offer up a vista across the Suzhou River. There’s a funky bar and lounge area at the hotel, meaning you won’t want for drinks and food throughout the day, plus there is a number of cool corners to relax in. The rooms are uncomplicated but clean and modern, offering up a comfortable place to stay. Home to the French Concession from 1849 to 1943, this former foreign area is now an upscale residential district. A place to go to escape the busy everyday life of Shanghai, in this enclave of calm, time seems to slip by much more slowly. Take a slow stroll along the leafy Fuxing Road and explore the streets for glimpses of rambling Art Deco mansions. The area is jammed full of chic coffee shops and trendy boutique shopping – it’s so enchanting you might even catch yourself thinking that you could live here. Don’t worry, it’s not so classically European that you’ll forget that you’re in the mega-city of Shanghai. The food on offer in the numerous restaurants and small eateries ranges from soba to tapas, and getting around is easy thanks to the numerous nearby metro stations. Hotels here are mid-range to high-end, with a handful of budget options on the edge of the district. InterContinental Shanghai Ruijin – Staying at this branch of InterContinental means staying in a slice of Chinese history that has also played host to such guests as Chairman Mao himself, and it was also the headquarters of the Communist Party in Shanghai. Beautifully decorated with marble bathrooms and understated decadence, the rooms feel cosy in a definitively opulent way. Dating back to 1917, the French-style hotel sits within its own 100 acres of landscaped gardens, for a true sense of secluded luxury. Needless to say, this is the ultimate in classic luxury. The area of Hongkou once hosted Shanghai’s ‘International Concession’, the result of a merging together of the British, American, and other foreign concessions in the Qing Dynasty; it was actually for a time known as Shanghai’s ‘Little Tokyo’. Though it’s got an almost suburban feel to it today, the history is strong here. For instance, during WWII, Hongkou was home to around 20,000 Jews in what was the square-mile-sized Shanghai Ghetto, having fled Nazi-occupied Europe in the late 1930’s. Even the hotels here are historic: there’s the elegant 19th-century Astor House Hotel and the Art Deco icon of Broadway Mansions, to name a couple. Elsewhere, you’ll find plenty of opportunities to recline in luxury or stay more affordably in Hongkou. Once the largest slaughterhouse in Shanghai, the concrete built ‘1933′ is now a collection of shops and restaurants that make for a cool evening, whilst Wu Xun Park is a good place for a breath of fresh air. Sofitel Shanghai Hongqiao – An elegant and grand hotel set in a building that abounds with classical French architecture, there are high ceilings at this branch of Sofitel, as well as impressive and luxurious lounges. There’s a selection of dining choices and a large indoor pool and fitness center. The rooms are lavishly carpeted, accented with touches of teal, and even come with their own chandeliers. This truly 5-star hotel also boasts a free shuttle to Shanghai National Exhibition Centre as well as to the airport. 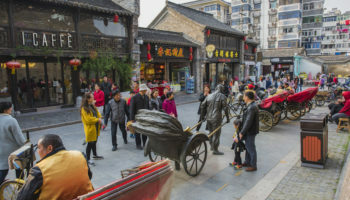 This old historic district dates back to the Ming Dynasty and today it’s booming with expat communities and families who want to live close to modern amenities and the buzz of everyday city life. 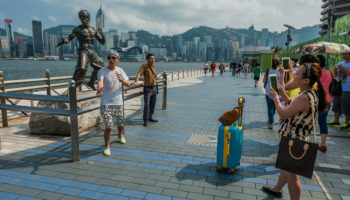 The area stretches all the way from Wanping Road to Yinping Road and encompasses many huge malls such as Grand Gateway 66, Metro City, and Orient Shopping Centre. Inside these rambling malls, you can buy anything from fashionable clothes and delicious food to computers. 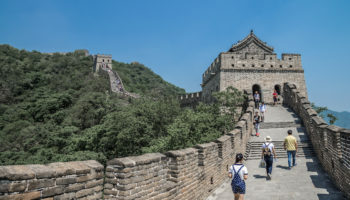 Xuhui also has fantastic access to the metro, with some of the largest malls in the city connected to the main metro lines, which means Puxi and Pudong are a speedy journey away. Hotels in this area range from shiny, modern high-rises to chic stays in historic buildings. Anting Villa Hotel – With its sweeping marble staircase, this hotel is pleasantly decorated for a cosy place to stay in the city. Anting Villa Hotel is housed in the same grounds as a historic building, a pastel, colonial Spanish-style villa that dates all the way back to 1936. It’s set among manicured gardens dotted with cedar trees. It’s a calm place to return after a busy day exploring the city. Rooms here aren’t luxurious, but they are clean and comfortable. This central district of Shanghai borders the lively Jing’an to the east and south-east and boasts the rail transport hub of Shanghai West Station, which makes Putuo a great place to stay if you’re planning to make an epic train journey across the country. It’s also a good choice to stay here for those interested in art; Putuo is home to the M50 Art District — one of the major centers of contemporary art in China. Set in and around a former textile factory are plenty of studios, as well as galleries, some open to the public. Wander around the repurposed warehouses and soak up the cool. Food fans, on the other hand, will relish the Muslim market and its culinary delights. 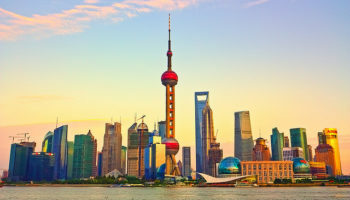 Staying here is good for those who like to save their pennies – there are some hostels and a few decent mid-range options, but not the same proliferation of 5-star hotels as in other areas of Shanghai: bad news for luxe travelers. Modena by Fraser Putuo Shanghai – A modern hotel with a sense of urban design, the interiors at this 4-star option are fashionable and it boasts a selection of studios, each with their own dining, kitchen and seating area. The creative, individually decorated communal areas, such as the restaurant and the games room, offer up cool, contemporary and fresh places to hang out. Other amenities include a fitness center and a children’s playground. Very close to a metro station, this hotel also has a Starbuck’s right next door, plus a convenience store where you can buy snacks and food to cook back at your studio. An inner suburb of the city, Minhang doesn’t boast the same frenetic liveliness as other areas of Shanghai. It’s mostly a residential area with a few factories and universities under its belt, but there are still things to see in this slightly out of the way district. A trip to the area of Xinzhuang will reward keen shoppers, thanks to the tree-lined Mingdu Road and the Sky Mall – complete with international brands on sale. For history, wander around pedestrianized Qibao Old Town, where old-style houses still dot the area and bridges cross canals in picturesque scenes. There are cheap eats to be had around Minhang, owing to the student population. The Old French Concession borders the north of Minhang, which is where you’ll find most of the hotels here; a mixed bag of accommodation from budget to more upscale. Hongqiao Railway Station — one of Shanghai’s main railway hubs — is located here. Hilton Shanghai Hongqiao – The rooms at this branch of the Hilton come with large windows with views of the gleaming city skyline and they’re warmly decorated with shades of plum and olive greens. They also feature large, modern marble bathrooms, large seating areas and comfortable beds. You can enjoy a massage at the spa, hit the gym or tuck in to the delicious dishes at any one of the hotel restaurants. You’ll also find a heated indoor pool and a rooftop tennis court for even more things to do. For a spot of golf, this hotel is also located near to the Hongqiao Golf Course.